Vermont Center for Occupational Rehabilitation (VCOR) provides reasonably priced, quality rehabilitation services to individuals injured at work. After completing our treatment programs, injured workers should have reduced pain and/or improved function, and the ability to successfully return to the work force. The challenge of treating individuals with sub-acute and chronic injuries is met with a unique and integrative approach. Recognizing the importance of providing a caring environment, the VCOR staff expects participants to learn the physical and behavioral techniques necessary to manage their own pain with self-care strategies. We also recognize the importance of communication between our center and those involved in managing the injured worker through the workers' compensation system. Before entering any type of program, an injured worker has a thorough medical examination to determine an accurate diagnosis. Behavioral medicine and physical therapy evaluations may be suggested by the physician and scheduled in conjunction with the medical assessment. Based on these evaluations, an intensive or sub-acute treatment plan may be recommended. Individuals having received conservative management of post-injury care for approximately six weeks and who continue to report significant pain are appropriate candidates for sub-acute care. After the physician's evaluation, an individualized, coordinated treatment plan will be recommended, typically including physical therapy, pool therapy, and soft tissue work 3-4 hours per day, 2-3 times per week for 3-5 weeks. Based on the evaluation of the physician, and if needed behavioral medicine therapist, recommendations will be made for workers with sub acute (six weeks and beyond) and chronic injuries that will be individualized in an integrative manner to optimally return them in a timely manner to a fully functional capacity. During course of treatment, patients will see multiple practitioners trained in a variety of approaches such as work conditioning, pool and land based strengthening, myofascial soft tissue work, osteopathic manipulation, injection therapy, pain management techniques (including biofeedback and relaxation), balance and gait re-training, and other muscle re-education. Typically treatment plans are designed for three days a week over a period of four- five weeks and based in each case on the primary medical barriers that Dr Johansson has determined is preventing progress in the individual through more standard approaches. Depending upon the severity and length of time since the injury, treatment can be one to five hours per day. Our goal is to safely and successfully return the injured worker to the work force. At the completion of treatment, every participant will have a thorough work capacity assessment. An appropriate release will be issued, which may include recommendations for a tapered return to work and/or a work site evaluation. If a complete FCE (Functional Capacity Evaluation) is warranted, we will refer that assessment to another facility fully equipped to measure all aspects of functional capacity. Post-program follow-up appointments are generally recommended in order to maintain gains achieved in the program and to ensure a safe and successful return to work. Medical end result (MER) is not automatically assessed at the end of treatment. However, at the insurance company's request, our physicians can make that determination and state any impairment associated with the injury. This appointment typically occurs 3 to 4 weeks post-program. We are located in Essex Junction, Vermont. Workers compensation insurance pre-authorization is required before an appointment will be scheduled. 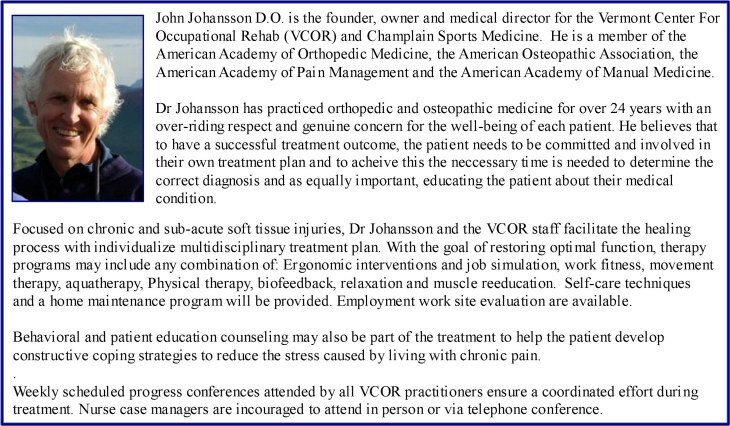 To schedule an appointment please call 802-878-9700. Fitness: Consists of conditioning, strengthening and work hardening. The VCOR work hardening program focus on functional activities designed to simulate the patient's work environment. Treatment is tailored to the patient's fitness level, injury and specific return to work goals. Ergonomic and postal education. Pain Education: Stress management, eliminating pain behaviors, biofeedback and relaxation training. Massage Therapy: Concentrates on reducing muscular tension, pain, increase joint flexibility, promote faster healing of injured muscular tissue, improve posture and help create an overall sense of well-being. Aquatic Therapy: VCOR's pool is 12'x 18' and the water temperature is maintained at 94 degrees. A heated pool helps decrease body aches, stiffness and promotes relaxation. Its low impact and high resistance environment, warm temperature and buoyancy make it ideally suited for gentle strength training, stretching and increases flexibility. Mary Ellen Giroux, M.A., Deb Warner, P.F.T. R.E.T., Janice Russotti, C.M.T. Bev Cyrulik, P.F.T., Eric Carpenter P.F.T. C.M.T. and Sylvia Fjeld, P.T. (Practitioner's Section coming soon).